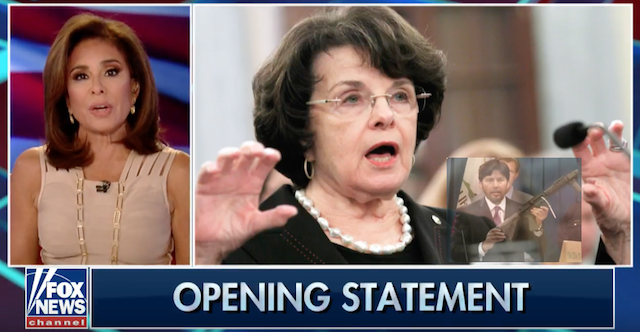 Judge Pirro burned Sen Dianne Feinstein over her and the ‘DEMONRAT’ party’s irresponsible 11th hour attack on Judge Kavanaugh, attempting to stop his SCOTUS confirmation. She sat on this information over the summer and didn’t speak of it during the hearing. It’s existence did circulate among a few DEMONRATS because Sen Mazie Hirono’s line of questioning during the confirmation hearing suggested she had something on him! What Feinstein and the DEMONRATS are trying to do was an attempt to capitalize on this #MeToo movement, which has become exactly as Pirro explained, the accused are guilty until proven innocent. And while they try to prove their innocence their life and livelihood gets destroyed by the PR machine the dems have exclusive access to via the corrupt media. The dems were trying to Bork Kavanaugh via the MeToo tactics! Thankfully the FBI is not going forward with any investigation because nothing happened. Let’s just say it was true though, who in their right mind thinks a teen boy locking a girl in a closet in high school is grounds to be denied sitting on the US Supreme Court!? Dems do, which is another reason you better get out to the polls this November to electorally EXTERMINATE democrats. ➡️ All this said I want to make something clear about Dianne Feinstein. As much as this site, the right as a whole, would like to see her gone from the US Senate that can’t happen until AFTER the election. Yes, this woman has to be allowed to win another term! Is STR insane?! WHY, many are asking? I’ll tell you why.. Among many of the craziness that takes place in California, the election rules have been perverted by the ruling one party controlled govt: the two candidates with the most votes in a primary election get to be on the general election ballot. Being a communist run state, conservative voters are outnumbered resulting in Dianne running against another democrat, State Rep Kevin de León. Take it from a conservative CA resident, this guy makes Feinstein look like a republican! He is responsible for many of the insane and unconstitutional laws in place against the Second Amendment and gun owners. Kamala Harris, when she was CA’s Atty Gen, along with de León have systematically turned law-abiding gun owners into criminals, and have made it VERY difficult to own a gun. From forced registration, banning of certain types of weapons, to the inability to buy guns and ammunition through the internet and very soon the need to have a permit to buy ammo!! Needless to say, as a US Senator de León will dwarf what Feinstein, Schumer and co have done to gun rights on a national level. STR is fully behind Judge Pirro’s rant against Feinstein and the DEMONRATS, but America the last thing you want is for her to get beat at the ballot box this November. Yes, it’s crazy to speak in her favor, but the nightmare that will come if she loses cannot be stressed enough. DO NOT use her attack on Kavanaugh to campaign against her. You’re being given a clear warning, you do not want her opponent, Kevin de León, serving with Harris in DC.